While watching the last few winter Olympic Games, I was fascinated by Curling. This week Ankie and I had the opportunity to experience Curling first hand. There is a Curling rink in Fernie, with a club running drop in evenings every week. At first glance the game definitely seemed to be related to bowls, which we are more familiar within South Africa. I must say we had great fun playing about 4 ends. I guess, like many other sports, it was a little trickier than it looked. 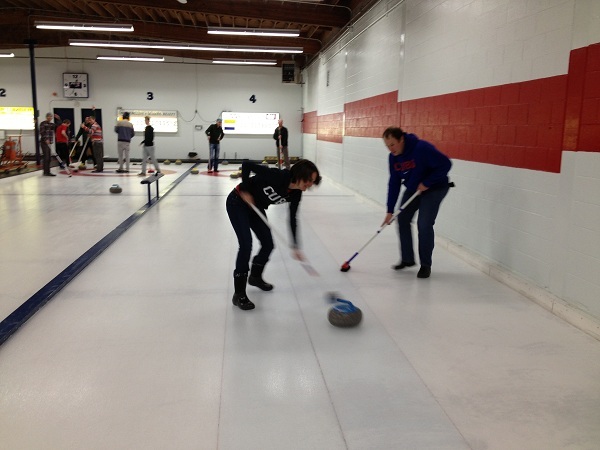 Curling in Fernie – Ankie is clearly better with a broom! As usually Ankie and I were a little early, so we started chatting to some of the club members hosting us at the Curling rink. They were very friendly and helpful. The Fernie Curling Club has about 8 teams that play regularly. The city of Fernie also supports the club to keep this popular sport in Canada in Fernie. As we chatted we quickly did some research on the game of Curling. It originated in Scotland more than 500 years ago! In the last Olympic Games in Vancouver the Canadian teams won the Gold in the men’s and silver in the women’s competition. There were only 10 countries competing. What was very interesting to me is that the team that represent their country at the Olympics is not the combination of the best individual players but rather the team who won the national championship. For example: 4 club players from Edmonton won the gold medal in 2010. Another of the club members gave Ankie a little help learning the game before the other NonStoppers arrived. The sliding to release the Rock was a lot trickier than I expected. We had to put on a special plastic slider underneath one foot to help with the sliding. The power control was not easy as I tended to slide the rock to fast, which would make it go over the target. Sweeping the ice to help the rock go further did not come as naturally to me as to Ankie. This entry was posted in Activities in Fernie, Fernie on 2013/02/04 by Justinus.